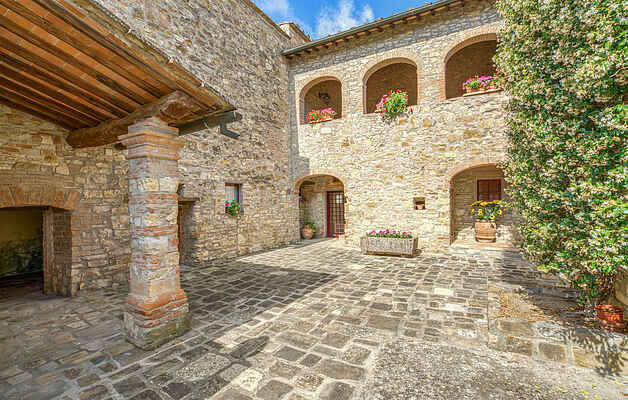 This beautiful mediaeval farmhouse in the Chianti hills, surrounded by vineyards and olive trees, was carefully renovated and transformed into 6 holiday apartments. The architectural characteristics that have made this part of Tuscany famous throughout the world have all been preserved with great care. This lovely and spacious first-floor apartment boasts a nice living/ dining with modern kitchenette. There is a lovely and spacious bedroom with double bed, a second bedroom with two single beds a third with another double bed. Furthermore the flat has no less than three bathroom ensuring all guests will have a very nice level of privacy. The entire estate benefits from a tremendously pretty and panoramic location from which guest will be able to admire the famous Italian countryside. The property, which is completely fenced-in and gardeners ensure it always looks its very best as they plant flowers, maintain the lawns and look after the swimming pool. There are various places of interest that come highly recommended such as ; San Donato (1.5 km - all kinds of shops), San Gimignano at 18 km, Tuscany’s answer to Manhattan and of course the stunning cities of Florence (20 km), and Siena (32 km). Mosquito nets in every room.